It was Sunday, our day to take a drive and enjoy beautiful Nevada County, but we were eating our breakfast and still hadn't decided where to go. We get no newspaper on Sunday so I had rifled through the stack of daily newspapers to find something I hadn't read. The Union's Prospector is always a good candidate because I seldom get to it when it arrives with Thursday's paper. Back in the calendar section was a small blurb announcing the Tulip Open House at Ananda Village I had always wanted to visit this school and retreat and here was a golden opportunity. 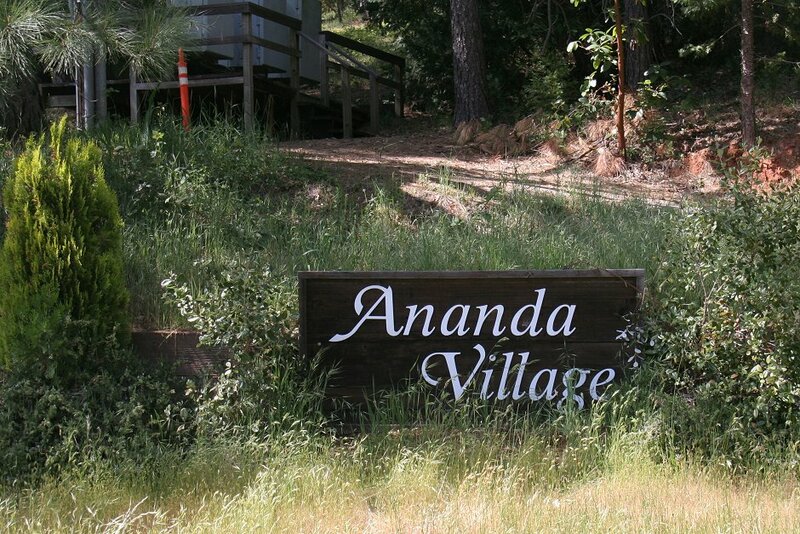 The shortest route to Ananda Village from our home in Lake Wildwood is north on Pleasant Valley Road past South Yuba River State Park, up out of its steep river gorge, and then west on Birchville Road to Route 49. 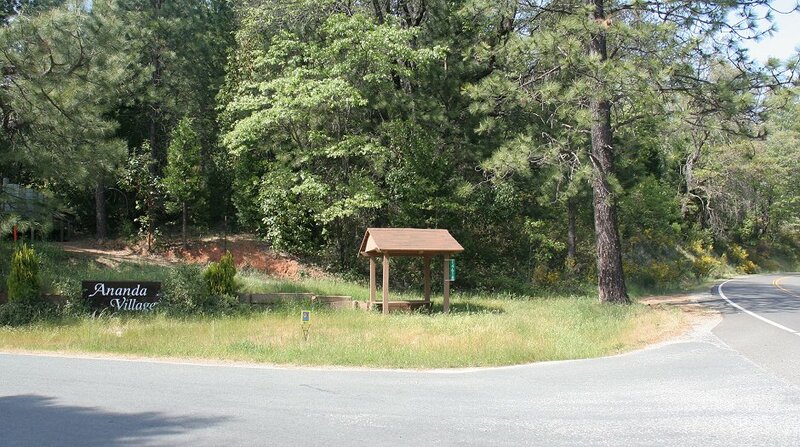 Directly across 49, almost like an extension of Birchville Road, is Tyler Foote Road, which we've taken many times to Malakoff Diggin's State Park. Today we had to go only 5 miles from the Rt. 49 intersection to get to the entrance of Ananda Village. I've taken larger versions of the pictures on these pages and created a brief slide show in full screen so you can see more of the detail. 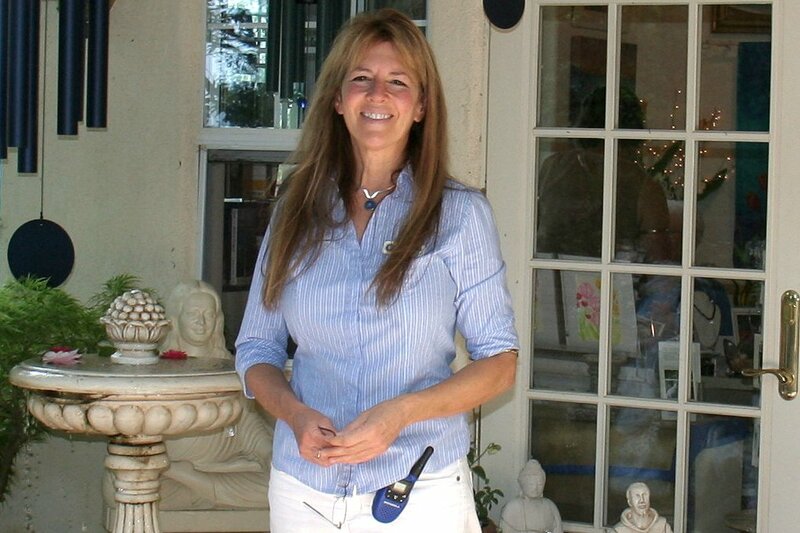 After I published the YouTube version, another video appeared by Cheryl Noble which is an interview made the same day Mary and I visited, with the garden's creators and perpetuators. 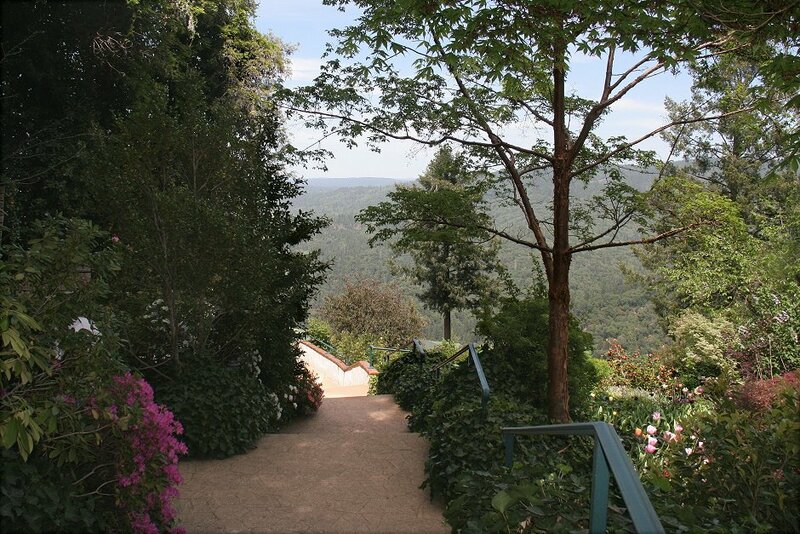 They give some of the history of the garden and Ananda Village in addition to very interesting facts about the garden. This video is also in full screen but only at the modest 720p of my YouTube show. I suggest you view her video first, followed by my ultra-high definition video if you are using a Windows PC, or my YouTube version if not. Modest definition for all Computers, iPads, iPods, 8:34 min. in Full Screen, 3:33 min. Computers, iPads, iPods, 3:33 min. This is the sign on the turnoff road to the village. 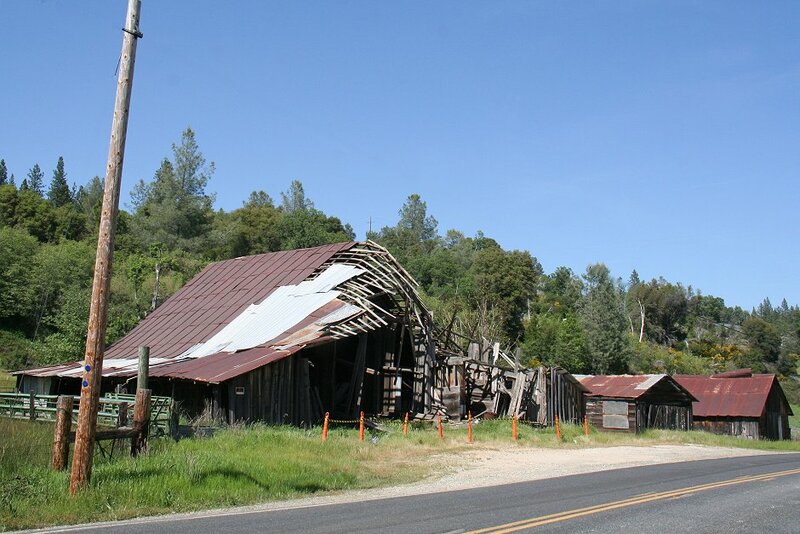 It's useful to know that a short distance before the turnoff is this old falling down barn, also on the left. Below is what you'll see at the Ananda Village turnoff. On the right is Tyler Foote from which you turn. The very tiny sign in the foreground is a picture of a tulip with a very tiny arrow pointing left. 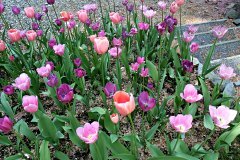 The Ananda staff had put tulip signs at every turn on the way to Crystal Hermitage Chapel & Gardens. 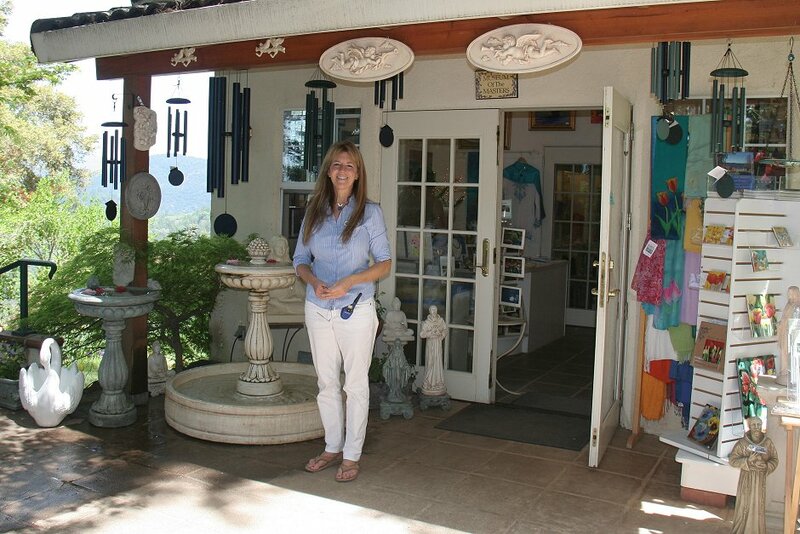 This is just a hint of the friendly welcome you will receive at Ananda Village. They live their beliefs. 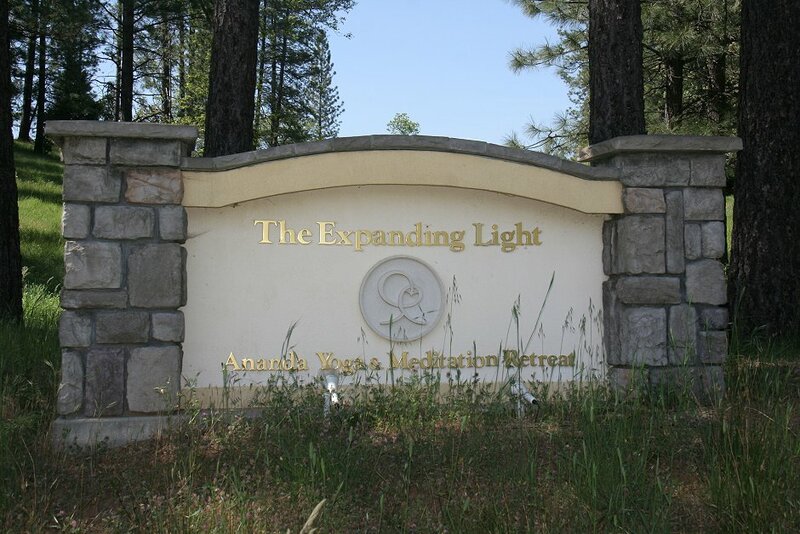 Another essential part of Ananda Village is The Expanding Light, a Yoga & Meditation Retreat. This sign appears soon after the Ananda turnoff, but on a side road. 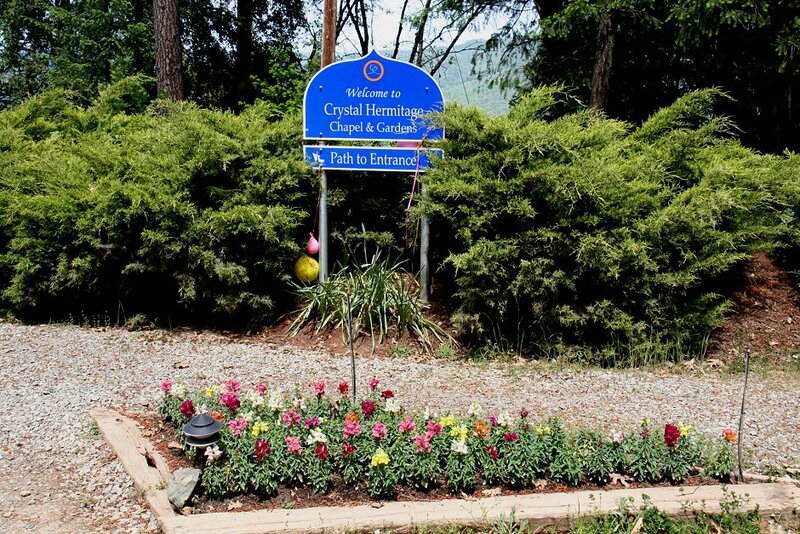 You will park your car near this sign to Crystal Hermitage Chapel & Gardens. Almost immediately on entering the gardens Mary and I were greeted by Mandala Skillman at the gift shop. She gave us our first brief introduction to life in the Ananda community, where many we met had taken Sanskrit names. breathtaking view from the top of a ridge out across Tahoe National Forrest. Below is a 3D version of the same photograph, to give you a feel for the depth in front of us. First appearance of tulips on our way down. 3D version of the same picture. 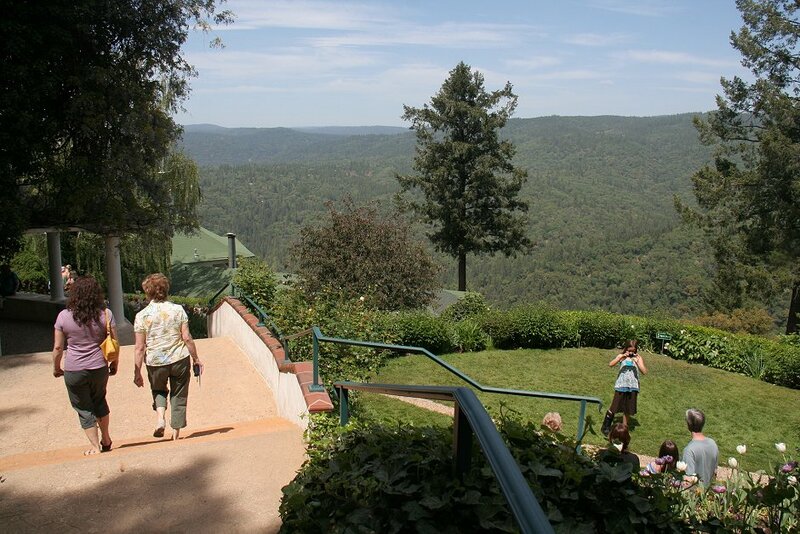 Here it is apparent that the landscape architect took full advantage of the spectacular hillside. You would miss this entirely without 3D. 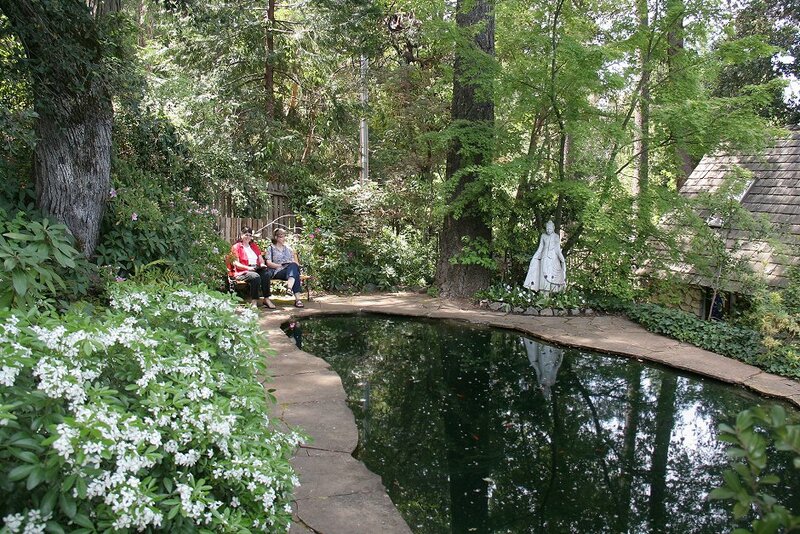 A couple enjoys a bench by a pond in a beautiful setting. 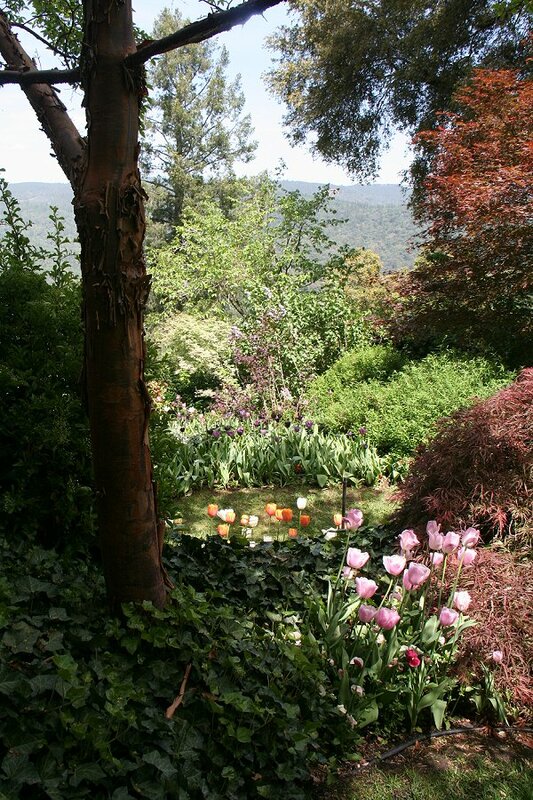 You can feel the sense of peace at Ananda. Another spectacular view from farther down the continuing stairs, this one out over the South Yuba River gorge. To see the picture pairs in 3D on this and following pages, look toward the central line between the pair and let your eyes relax as though looking through the screen. As your eyes relax the pictures begin to overlap. When they overlap completely the center of your two-eye vision becomes a single picture in 3D. 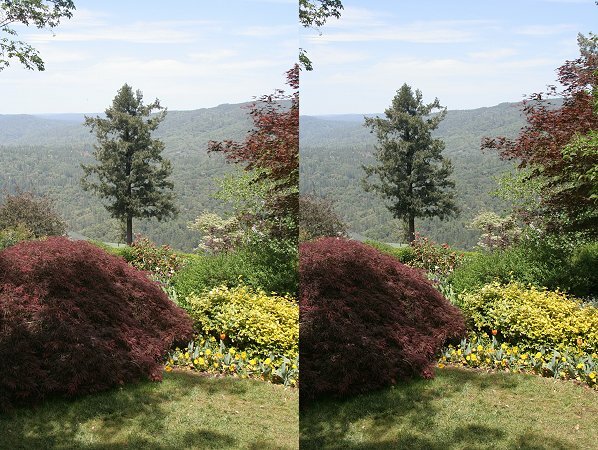 Ignore what you see on either side of the 3D picture with your peripheral vision. 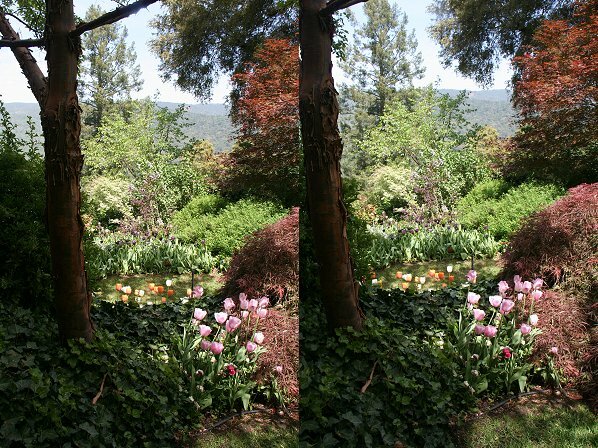 Focus your attention on the center image and gaze around and perhaps blink your eyes until a 3D picture pops into view. Return to 3D picture.